Honestly, I am not trying to make enemies here, but it seems to me that every company that thinks they can build an internal lead distribution system spends so much time on this that they miss golden opportunities doing what they are best at. I mean, did you really get into online marketing to build software? Why do I still get at least one customer per week saying “We spent $500,000 or we spent $50,000 in India and we still don’t have a working solution.” I understand the motivation, I really do. First, you firmly believe you can control costs by having your own internal system. Second, you think it would be really cool to make a system that has some Ninja methods that will make you more money than the next lead gen company. Third, you firmly believe that there is nothing else out there that has what you need. Cost: $1,550-$2,500 per month depending on the company you select. • How much are you worth? What is your hourly rate for the time, energy, heartbreak, and slow agonizing head banging you are about to inflict upon yourself? • Let’s say you are a decent executive and worth $100 per hour. We are on year 5 of development on LeadExec, and although you don’t need everything we have, I would say 2 years is appropriate. This would amount to 2,088 working business hours per year. Let’s just say you spend 25% of your time communicating, planning, and working with a developer. This doesn’t include the actual developers. And if you think you can hire a guy for $20 an hour in India, the Philippines, or any other country for less to do this job you are slightly delusional. Sorry if I sound harsh, but the reality is that lead distribution systems are very complex. If there is a language barrier you better add another 25% to your hours spent working with an overseas developer. And that is only if these developers pull off a miracle and actually understand all of the concepts and calculations. In addition to all that, let us hope they are also able to make a decent user interface. *Please note that I used a $20 an hour rate for overseas development. US developers on average make about $55 an hour or more. You would have to pay ClickPoint to license LeadExec for about 23-45 years to make up this cost. Lets consider the Ninja methods you think you have discovered while working for a top secret lead generation firm that only employs the most highly skilled tactical lead distribution methods to monetize leads. This is an easy one. We have been doing this for about 10 years and have worked with over 200 lead generation companies; some that create leads, some that arbitrate leads, some that use radio, some that use e-mail, some that use SEO, PPC, direct mail, and more. We have worked within every lead vertical from Mortgage, Health, EDU, PayDay, Automotive and more. We listen to our customers and have built and continue to build our system from user feedback. We have seen every way there is to skin a lead and trust me there are many. Your Ninja method is likely nothing we have not seen before. Sorry, but black magic doesn’t run a lead distribution system. Flexible software designed to be customized around your needs is what you want. 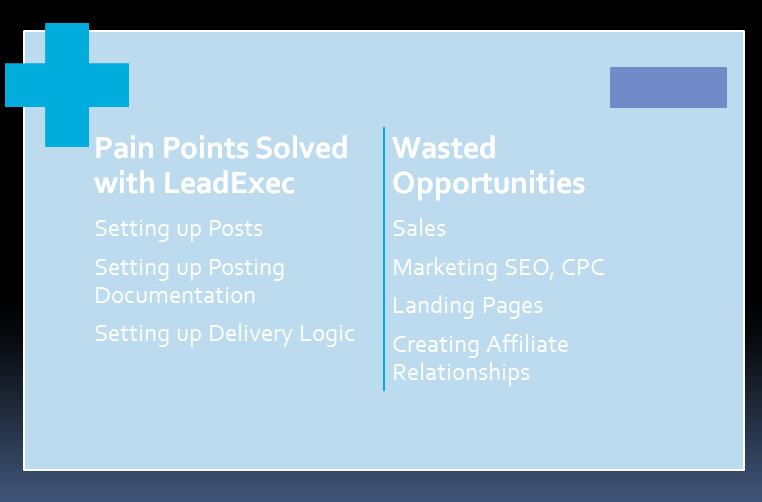 Save the black magic for establishing your lead return program and punishing bad lead sources we expose with lead scoring. I am not going to talk anymore. Take the Free trial, watch the wizard tutorial. If after doing this you think that we have missed something, please call me personally and let me know about it. My direct line is (602) 535-5652. I welcome your call and we can talk about how we can work it in on our next update. This entry was posted in Lead Generation System and tagged Lead Management on June 20, 2011 by Gabriel Buck.